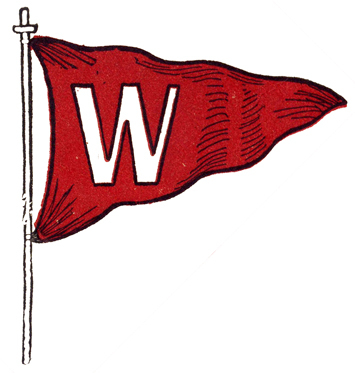 The story of 103 years of homecoming at Wabash is full of rituals, traditions and passion…passion for sport, passion for victory, but most of all a passion for this special place. 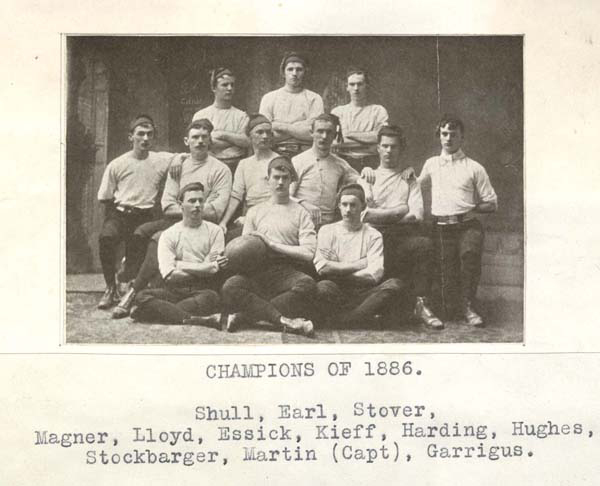 This Indiana championship team was the first to wear the scarlet. And this is a scrap of the first scarlet ever worn! 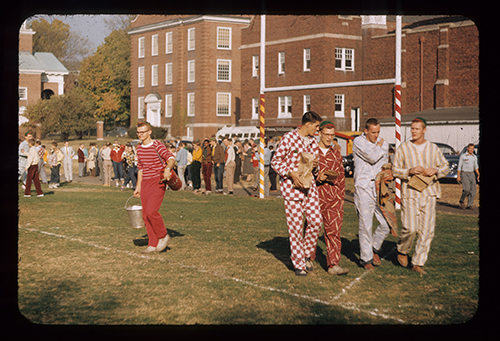 At the start of the 20th century football fever gripped the nation and colleges began hosting homecoming weekends. 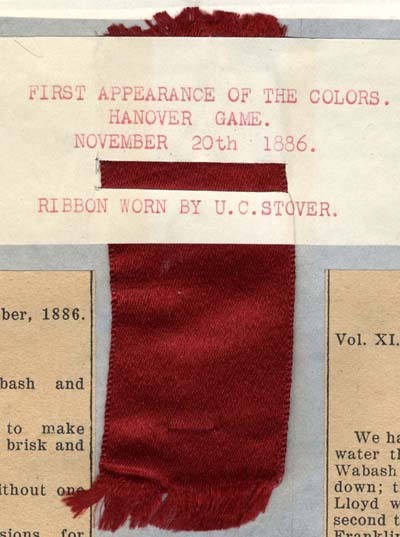 Driven by the Chicago Alumni Association, Wabash’s first homecoming football weekend was in 1912. The Roaring twenties saw Homecoming firmly established. House decorations, stunt night, bonfires, dances and chapel sing all came into being at that time. Homecoming as we know it was here to stay. The Sphinx Club came in the 20’s too. In December of 1921 a group from Wabash travelled to IU and brought back the Sphinx. 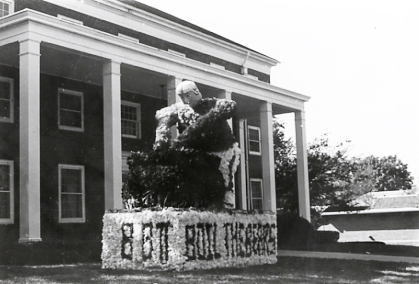 The club quickly assumed many duties at Homecoming, as they still do today. Chapel Sing, known in the past as Freshman Sing, was more of an individual ordeal as it was every man for himself. 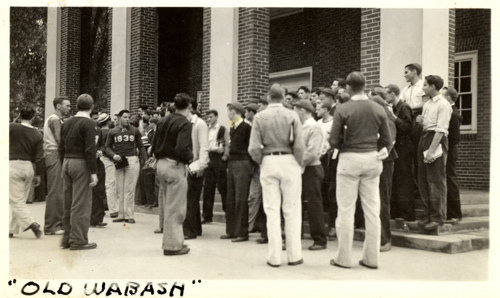 Note too in this picture of the 1930s that the freshmen are all wearing their “pots” or beanies. All the freshmen are being closely watched by the members of the Senior Council who served as judges for the sing. 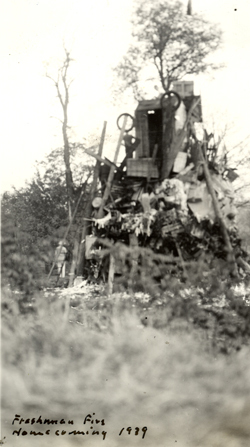 The homecoming bonfire was a big deal and the gathering of the materials for the fire sometimes led to trouble with our neighbors. It seems that any old fencing, odd bits of lumber and the neighbor’s old outhouse were all fair game for the scavengers! Over the years the traditions have changed, freshmen no longer wear their pajamas and gone are the pep rallies at the Courthouse. But the floats, that don’t, the queen contest, the banners and chapel sing all continue.